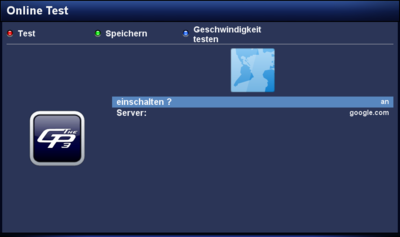 With the Online Test it's possible to test the connection with any computer / IP adress. Activate the Online Test and enter the desired sever name / IP adress. Save the settings with the green button. Once you reopen the Online Tests, the connection can be tested with the red button. The status of the Online Tests is visible in the infobar, if an GP3 Skin is used, e.g. as as globe. Test Test the connection with the set Host name / IP adress. The result is displayed (succesful / not succesful). Speed Test Test the connection performance of the internet connection, and see the result on screen. Function based on the speedtest_cli and is available since GP3.2 Version v0.79r6. Activate? Activates (on) or deactivates (off) the connection test. Server: Enter the server / IP adress to perform the test. Diese Seite wurde zuletzt am 1. März 2014 um 20:52 Uhr geändert.